Third PLPR Pacific Rim Regional Meeting – Taiwan! The Third PLPR Pacific Rim Regional Meeting of PLPR will be held on 16-17 April 2018 in Taoyuan City, Taiwan. 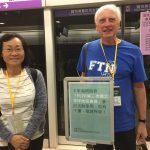 Our hosts are Taoyuan City Government in partnership with National Pingtung University. Click here for details. Conference 2018: Novi Sad, Serbia!